Austria-Hungary’s third invasion of Serbia is another failure. Germany’s Pacific Squadron is destroyed at the Falklands. Austria-Hungary stages a successful offensive against Russia. The German fleet bombard British coastal towns but miss a great opportunity. Turkey launches an ambitious offensive into the Caucasus. Some truces take place on Christmas Day. Yesterday the Turks attacked Sarikamish and were repelled. Furthermore, enemy artillery fire is exacting a terrible toll on Turkish forces. The Turkish army in contrast has struggled to bring its artillery through the snowy mountains to the front. Enver’s subordinates report to him that their forces are too depleted by the cold and enemy action to attack again, that in any case the men are too weakened by hunger to press home the assault. But the Turkish Minister of War is unmoved. Enver still sees Sarikamish as an opportunity for Turkey to win a decisive victory over the Russians, one that would be worth any cost to achieve. He issues his order: “The offensive is to go on at full strength”. The Germans are using large numbers of trained dogs in their armed forces. The animals fulfil a variety of roles, from assisting medical personnel to serving with sentries and patrols. 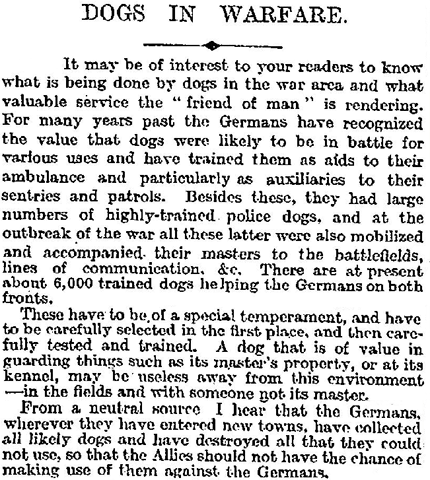 Now a letter writer to the Times of London reports that that the German army has such a need for dogs that whenever an enemy town is captured, all suitable dogs are immediately pressed into the invader’s service. To avoid any of the remaining animals being used subsequently against them, the Germans are apparently destroying all dogs that they do not take into their service. Enver’s bold plan to drive the Russians from the Caucasus has come unstuck. His army have finally made it to the gates of Sarikamish, but the harsh weather, shortage of food and lack of winter equipment have greatly reduced their numbers. Now the depleted Turks assault Sarikamish, in places charging across waist deep fields of snow. 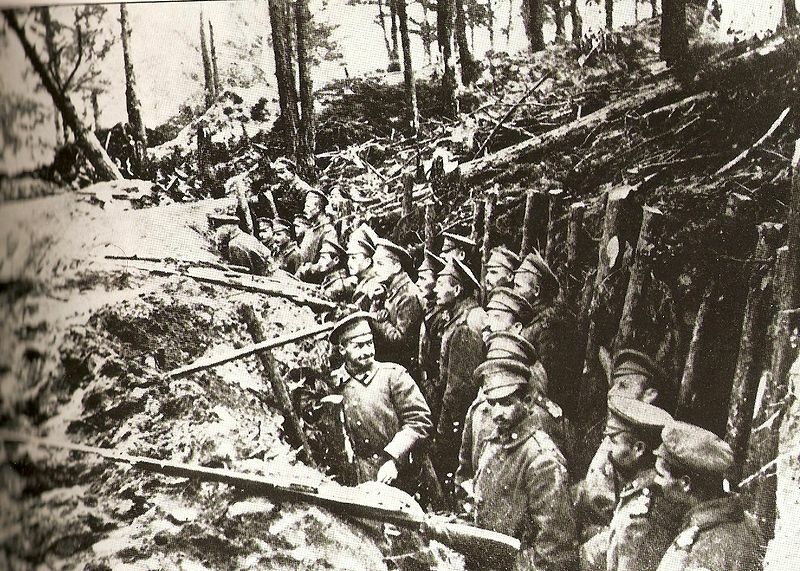 But the Russians are in well-prepared positions and they repel the Turks, inflicting terrible casualties. Britain suffers its first naval defeat in 100 years. Britain’s invasion of German East Africa fails. Germany and Russia lay into each other in Poland. Austria-Hungary has another go at invading Serbia. Germany loses its last Pacific possessions. Major fighting at Ypres comes to an end (for now). I have updated my list of who’s who in 1914. These are mostly people who have been tagged in more than one post. You can see this list here. Ismail Enver, Turkey’s Minister of War, is leading an attack on the Russian military base of Sarikamish in eastern Anatolia. The plan of attack is bold, calling for units to move at great speed to outflank the Russians. Things are unfortunately not going entirely to plan. Turkish forces are struggling to keep to the schedule set by Enver. By now they have outrun their supply lines and many Turkish soldiers are out of food. The cold of winter is exacting a terrible toll, not helped by Enver’s decision to speed the advance of the troops who have to go furthest by denying them winter coats and equipment. The Turks are dying of exposure in very large numbers. And yet, the Russians are rattled by the Turkish advance. The overall commander has panicked and fled to the fortress city of Kars, ordering the rest of the Russian army to follow. 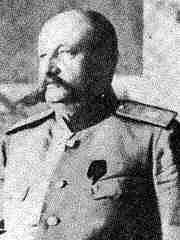 But his subordinate, General Nikolai Yudenich, is more confident. He believes that Sarikamish can be held and a defeat inflicted on the Turks. He resolves to stand and fight.